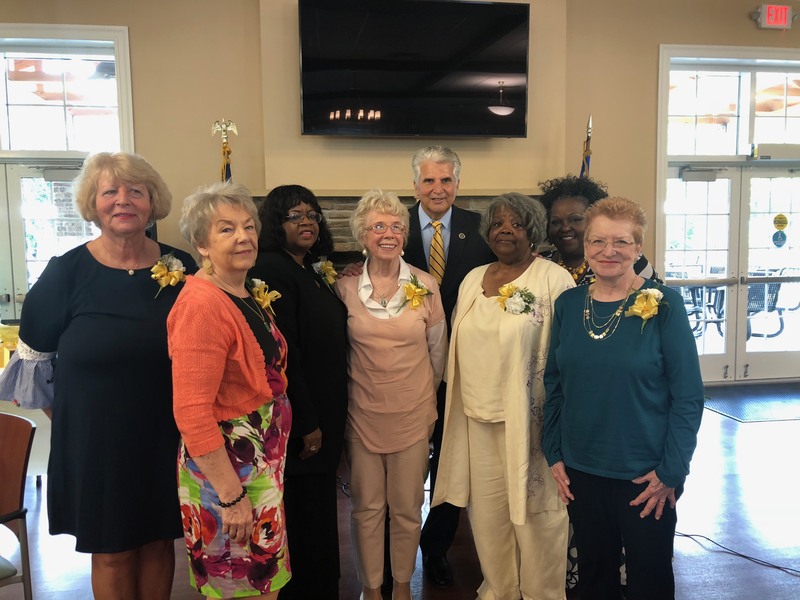 Cedar Grove, NJ – Essex County Executive Joseph N. DiVincenzo, Jr. and the Essex County Division of Senior Services recognized the writing talents of eight Essex County residents during the Annual Essex County Senior Legacies Writing Contest Celebration Luncheon on Wednesday, May 23rd. The Legacies Writing Contest encourages Essex senior citizens to write essays about the people and events that have influenced their lives. “Our Senior Citizen Legacies Writing Contest is a unique way for our older population to share their life’s stories and describe the people and events that helped to shape their lives,” DiVincenzo said. “Our seniors’ stories make you laugh and they touch your heart. They provide us with a different perspective on historical events and what our society was like,” he added. Winning stories were “Lullaby for a Friend” by Kathleen Noland from Bloomfield, “Survivor” by Anwar A. Shah from Newark, “Port Chicago Disaster” by Ruth Steele from Irvington and “Sights and Sounds” by Joyce Swain from West Orange. Honorable mention stories were “My #Me Too Moment” by Belinda Plutz from Montclair, “What He Taught Me” by Kathleen Witcher from Irvington, “The Torment of Love” by Paula Zaccone from Bloomfield and “Something to Live For” by Joseph Zullo from Montclair. “All our seniors have stories to tell, and our Legacies Writing Contest provides our older adults with an incentive to preserve their memories, and create a living history,” Essex County Division of Senior Services Director Jaklyn DeVore said. “Writing enables our seniors to share their memories with friends and families, allows them to reminisce about old times, and keeps their minds active. This is one of our most popular events because of the emotions and memories that are evoked,” she added. Kathleen Noland from Bloomfield wrote “Lullaby for a Friend,” which was chosen as one of the winning stories. Ms. Noland shares the story of a close friend who has Alzheimer’s. While they once enjoyed working and vacationing together, and keeping in touch by phone, her friend’s disease has progressed and she sometimes does not recognize Ms. Noland. To raise the spirits of her friend, Ms. Noland sings Irish songs, including the Irish lullaby “Too-ra-loo-ra-loo-ra.” “I know I won’t run out of songs, but I know I’ll run out of calls,” she writes. “As hard as it is for me to take these calls, I don’t want them to stop coming,” she concludes. Anwar A. Shah from Newark had his essay “Survivor” recognized as one of the winning stories. Mr. Shah has had an interesting life traveling through the Middle East and Europe, before immigrating to the United States and settling in Newark. Born in India, his family moved to Pakistan in 1947 when India declared independence from Great Britain. During the move to Karachi, the train on which his family was traveling was attacked and the boat sailed through a storm. He took a job with an airline company in England then moved to Iran where he built a lamp manufacturing company and then worked for a pharmaceutical firm. He left Iran in the 1980s after an uprising in which he was able to see gunfire from his office window. His brother helped him come to the United States, first in Texas and then to Newark, where he worked in several capacities for New Community Corp. Now retired, Mr. Shah enjoys visiting Essex County Weequahic Park. Ruth Steele from Irvington wrote “Port Chicago Disaster: A Family Tragedy,” which was chosen as one of the winning essays. Ms. Steele’s uncle Arthur Reid joined the U.S. Navy in World War II to support his family after their parents passed away. Unfortunately, Mr. Reid disappeared and his two younger sisters, Ms. Steele’s mother Annabelle and Aunt Margaret, never were told what happened. Much later in life, an employee of the Union County Office of Veterans Affairs and the late Congressman Donald Payne assisted Aunt Margaret in finding out what happened to her brother. Seaman Reid lost his life on July 17, 1944, during the Port Chicago Disaster when a munitions explosion killed 320 sailors and civilians and injured 390. The explosion occurred because safety protocols for loading munitions onto ships were ignored. Ms. Steele learned her uncle received numerous citations posthumously and his name is engraved in the Port Chicago Naval Magazine National Memorial. Joyce Swain from West Orange wrote “Sights and Sounds,” which was chosen as one of the winning essays. Ms. Swain remembers the good old days of growing up on Prince Street in Newark. The neighborhood was a melting pot of races and ethnicities where everyone got along. Jake Green’s rented horse-drawn wagons for produce delivery, weddings were held in people’s homes or at the Prince Hall Masonic Temple and the aromas from the bakeries, delis and home kitchens made the neighborhood smell spectacular. Going to the movies was what people did in their leisure time, and shop owners, military veterans and homemakers looking out of their windows watched over the neighborhood. “I experienced kosher delis, fresh warm rye bread, fresh fish, bottled milk, the mailman, hair dresser, 5&10, hair ribbons and Old Spice, to mention a few. I miss them,” she states. Belinda Plutz from Montclair wrote “My #Me Too Moment,” which received an honorable mention award. When she was 38 years old, Ms. Plutz applied for a position as a salesperson for a software company. It was 1980 and the product was medical billing software. He met the vice president of sales in his hotel room by the airport and, after a lengthy interview and beginning to feel uncomfortable, Ms. Plutz ended the meeting. She told the man she obviously wasn’t right for the job and he replied “You haven’t really blown me away.” After thinking of the exchange, Ms. Plutz needed closure and mailed 100 pieces of bubble gum and a note describing the gum as a “Blow Yourself Away Kit.” The letter caught the attention of the company’s superiors, who looked into this and other reports of harassment, fired the vice president and hired Ms. Plutz. Kathleen Witcher from Irvington received an honorable mention award for her story “What He Taught Me.” Ms. Witcher writes glowingly of her late father, Leonard Holman. He worked long hours at his upholstery business, but he always found time to assist in the community, coaching basketball and baseball teams, chauffeuring children to athletic facilities in other towns so they could play, volunteering with the Juvenile Justice Committee and becoming a PTA president. Mr. Holman seemingly could do anything in his daughter’s eyes – except cook. Ms. Witcher remembers the golden rule her father taught her, which is “Do unto others such as you would have them do unto you.” “I might not have understood it them, but I understand it now,” she writes. “I think our communities, and our world, would be better places if we followed what my father taught me,” she concludes. Paula Zaccone from Bloomfield received an honorable mention award for her story, “The Torment of Love.” Ms. Zaccone tells the story of Gemma and Ari, two college professors who met at work, fell in love and married. However, at some point, their relationship began to suffer. As Gemma advanced in her profession and became a full professor, Ari’s career took a different path. The school changed his schedule and had him teaching introductory courses at difficult hours. Ari took his anger out on Gemma, and the two filed for divorce. After years without contact, Gemma learned Ari was in bad health, and she visited him in the hospital. It was then that “her senses told her that there was more to pain and loss than that of divorce,” she writes. Joseph Zullo from Montclair received an honorable mention award for writing “Something to Live For.” Mr. Zullo writes about a 17-year old named “Joe” who was severely injured in an automobile accident. After being “asleep” for about a month, Joe awakens from his coma and begins a long rehabilitative process. He walked into wall, locked himself in a bathroom and needed the help of others to feed and bathe him. But Joe never lost his spirit and his determination to return to being the same person he was before the accident. Today, his short-term memory can be faulty, he walks irregularly and his hands tremble, but “he’s back to his inherent good looks, his mind and most of his exceptional abilities are as sharp as ever,” Mr. Zullo writes. “The time has come to put the past behind him and get on with the rest of his life,” he concludes. Students from Cedar Grove High School, Alysa Handel, Chris Handel, Haley Diess and Tara DeCorte, read the stories during the program. “You don’t have to be a professional writer to participate in our Senior Legacies Writing Contest. Our seniors are very talented and they write from the heart,” Essex County Director of Citizen Services Anibal Ramos said. “Every year, I am impressed with the emotion and quality of stories. I congratulate every one for participating,” he added. Sponsored by the Essex County Division of Senior Services, the Legacies Writing Contest was started in 1996 and was part of a national contest which encouraged senior citizens to discover the joys of writing while sharing their stories with others. Although the national contest was discontinued in 1998, the Essex County Division of Senior Services continued to sponsor the Legacies Writing Contest on a local level. Entries are judged on the writer’s ability to engage the reader with humor, emotional impact or rich descriptions. Winning stories were selected by a committee of volunteer judges and staff from the Essex County Division of Senior Services. The Essex County Division of Senior Services offers a wide range of services to eligible Essex County senior citizens. The Division offers adult protective services, provides basic transportation services, administers adult day care centers, offers counseling services for caregivers, provides home delivered meals and offers visiting nurse services. For more information, please call 973-395-8375.